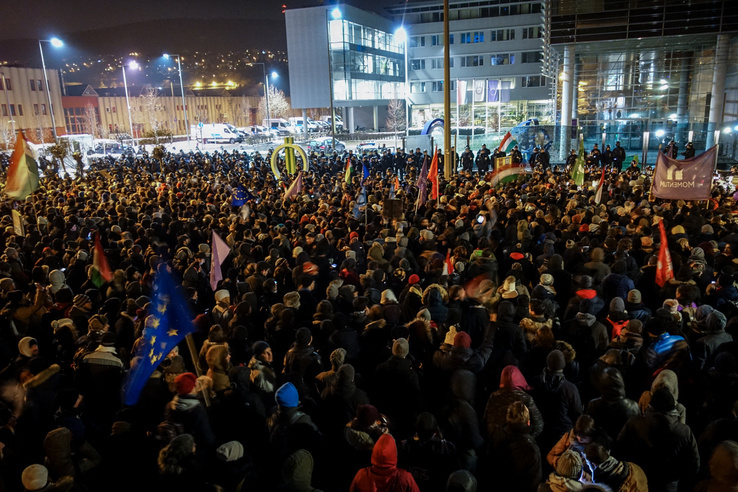 Thousands of enraged demonstrators, during the fourth night of angry protests over the past week, marched to the headquarters of Hungarian state television in Óbuda, in the hope that the taxpayer-funded Fidesz propaganda machine that pretends to be a public broadcaster would allow for the demands of the opposition to be read on air. Riot police outside the building tried to keep the crowd at bay, as they were pelted with eggs and other projectiles. Meanwhile a handful of opposition MP’s, including Ágnes Vadai, Bernadett Szél, Ágnes Kunhalmi, László Varjú and Ákos Hadházy, managed to enter the building, engaged in heated exchanges with security, but were ultimately unable to convince the television station to allow for the demands of protesters to be presented to viewers on air. Ms. Vadai, speaking to infuriated demonstrators in front of the public broadcaster’s headquarters, urged them to remain calm and noted that other MP’s were still in the building and were engaged in negotiations with television staff. Ms. Vadai’s words did not appear to have much of an effect, as a growing number demonstrators roared that the crowd ought to storm the building. Massive demonstration in front of Hungary’s public broadcaster–today nothing more than the taxpayer-funded propaganda organ of Fidesz. Meanwhile shortly before 23:00 Budapest time, MP’s still inside the public broadcasters headquarters called on all 66 opposition MP’s to come to the headquarters as well. At the same time, police used tear gas against the first line of demonstrators, while a growing number of protesters called for a push towards storming the building. The official line as to why MP’s are not being afforded air time is that there is nobody at the television station with authorization to approve this. Rather conveniently, Dániel Papp, who can authorize this, did not pick up his phone all night. Meanwhile, in a typical display of how the public broadcaster functions, the evening news broadcast spent about a minute on the demonstrations from today, with the following brief assessment of the events: “The protests are not a driving force in society.” And in another display of taxpayer-funded media in Hungary, the country’s state news agency, MTI, published an eight sentence summary of the protests. Hungary’s opposition parties are finally becoming more aggressive in their tactics against the regime. Protesters, even after four days of demonstrations, are still furious and there is no sign that the anger is dissipating. Hungarian state media, functioning under the direct instruction of the ruling party, won’t give an inch and is in no position to even maintain the pretense of fairness in broadcasting. The obvious Orbanian ploy — two-steps-forward (slave-law plus fake-parajudiciary) and then one-step-back on the slave-law — needs to be loudly exposed and discredited by all of the opposition. The only hope of mitigating it is by making it super-explicit, both domestically and internationally. Time to call for GENERAL STRIKE! Demonstrations are not strong enough to force the criminal gangsters in power to run for their life. These criminals, led by the viktor, grabbed power by cheating 2/3 majority in every single election since 2009 and before they tried to overthrow the Government in 2006 September. I’m amazed that this (general strike) didn’t happen when the original 250 hour/ one year delayed payment version of this ridiculous law was introduced. 3. The Hungarian socio-liberal opposition is out to lunch. It is unable/ unwilling to work, to organize itself across the country and govern the country in a manner that is just, observant of the rule of law and mindful of the requirements of sustainable economic development. It has swallowed hook line and sinker the myth about the supreme wisdom of the unregulated market, but has been unable to put into practice even that ill-advised enterprise. God save this country, in case its popular revolution succeeds. This country is stuck between a stone and a hard place. Really? Because I just read Nepszava, and it seems very much against Orban to me! I also watched RTL recently, where they bashed the government intensely for about half an hour. And you also often link to sites that are critical to current government. On the other hand I cannot find a single MSM report on the video made of CEO of Advocates Abroad, where she brags how her nearly 400 strong staff coached at least 15,000 migrants how to lie in order to get asylum in EU. I checked in English, French, German & Italian and no luck! It is basically a successful version of what was attempted in the first four days in the aftermath of the NYE attacks in Germany where 1,200 women were raped or molested. That one failed, as we know, but this one they succeeded in! Come again about media freedom? The fact is that the state operated and publicly financed media will not give equal time, and in this case, anytime to the opposition, is a pretty clear sign of drastic curtailment of media freedom. Except for this link, I’ll leave the rest of the evidence to others. Must be causing you a bit of cognitive dissonance to see Jobbik should-to-shoulder on the streets with liberals. Getting nervous? “The fact is that the state operated and publicly financed media will not give equal time, and in this case, anytime to the opposition, is a pretty clear sign of drastic curtailment of media freedom.” Any different from how German state media treats the AfD? And yes, it does make me nervous. If this movement were to succeed, based on what happened the last time such a movement succeeded in the region (Maidan), incomes and GDP/capita dropped by half, and in my view the economic damage is such that within current global economic and geopolitical context, it will never recover. Do I want that for Hungary? No! It makes me nervous! Mr. Adams, check the coverage of the riots. If you did due diligence, you would have realized that this upset was finance from abroad. Check the proof. Surely it was Soros !! …. you’re like a bloody galah, parroting someone else’s words with zero understanding. In 1956 a similar situation arose in front of the State Radio. First the demonstrators were attacked by the AVH guards but then the military came to help the crowd, providing them with guns. That pressure finally made the guards yield and the demonstrators were able to read their 12 demands on the air. My question is: why can’t the military come to join the demonstrators today? 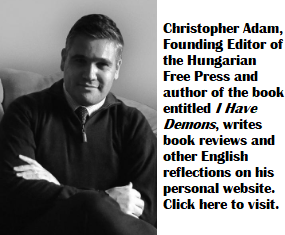 Hungarian politicins on all sode of the isle might better read this and cool their heads, before things might get worse ! It’s a stupid decision to create slave law by Victor Orban Gov. Workers should stop to work to show their willingness to change this law. It is against the fundamental rights. IF PEDIGA in Germany would have tried to do the same in Germany, in relation to the state propaganda machine, they would have probably been all arrested and charged. Same if Trump supporters would just go and demand air time at CNN! Seriously? Are you so blinded by your ideology that you no longer understand the difference between privately held CNN and MTVA, which is a “Crown” corporation? Do you seriously think that in Canada for instance the CBC would do everything in its power to ensure that democratically-elected opposition MPs are blocked from sharing demands or other points within the context of a news broadcast or an interview? My German example is far more relevant, because there is a state-owned broadcaster, which BTW treats Germany’s opposition AfD like trash, same as much of the MSM, while on what has been Germany’s number one topic, we had employees confirm that they felt compelled to support Merkel’s policies. Now what do you think would happen if AfD members would try to break into a state broadcast facility in Germany? How would the MSM portray it? How would the authorities respond? What would you personally think of it? Would you sympathize? The Canadian comparison is irrelevant, simply because as far as I can tell, in Canada there is a complete 100% ideological autocracy in place. The differences between main parties are cosmetic, with most minor differences treated as major rifts, only to create some resemblance of democracy. Too many major subjects in Canada are debated as a one-way street. “Do we increase the number of migrants we take in to 300,000/year, or 315,000?” and then a “heated debate” will rage! But how many decades since a Canadian MP stood up and questioned the wisdom of changing Canada’s demographic identity from a European offshoot, to an Asian offshoot and what that may mean for Canada’s current population and its future generations? So please name the opposition party that would “demand” to have its very “different and opposing views” aired on live TV? I think for that to happen, you would have to have some actual differences that an opposition movement demands to have heard. The time for real debate in Canada ended decades ago on most subjects. Your German example is completely false, unless you are saying that German state media bans every opposition party? In Hungary, MTVA is not banning one opposition party, for whatever reason, it is banning everyone not called Fidesz-KDNP. And there is absolutely no attempt to explain why this is the case, except that somehow nobody has authorization to allow them to go on air, and the one person who does is not picking up his phone and did not show up for work on Monday. This is the behaviour of a third rate banana republic. Dear HFP, the German state media bans one opposition party, because there is only one real opposition party on the scene (with arguably the exception of the Left party, which does not get much better treatment), because the other ones are all sponsored by the same sponsors, with the same general interests in mind, with differences mostly cosmetic, as is the case with the Canadian political scene, so it is 100% accurate. You don’t get it yet do you? Most of the Western World has been ruled for many decades now by political groups that mostly have been creating a mirage of real choice and political-ideological competition. But in fact they have been the same general choice that the electorate has been voting over and over again, under different names, with changing faces, but serving the same ruling establishment. For the past few decades, this ruling elite has been failing to deliver for the masses, only taking care of the top tier, and a few mid-level professional elites, and some of their ideological pet projects, so there is now a rise of an actual opposition to the ruling elites. Now we are starting to see the true state of Western Democracy, complete with well-coordinated censorship and propaganda, the closing of the ranks of institutions (Academia, MSM, Business elites) shutting out the real opposition, using their might to keep it down. In Hungary and a few other places, this opposition succeeded, because a group of what has been thought of as dependable ruling elites of a vasal state, switched sides. Places like Italy, where the economy is in such a poor state, and room for change so narrow (because of Euro), the real opposition managed to get into power, but the only thing that they gained is an opportunity to oversee the actual collapse, for which they will get blamed, thus helping to serve the discrediting of opposition. In the US, a member of the elite thought it would make for a good show to pose as real opposition and found himself elected into a position he never thought he will be elected into, and possibly did not want to be elected either. Point is that the electorate preferred to elect a clown just so they can give the elites the middle finger salute. Hungary is not the banana republic dear HFP, the entire Western World is on the verge of becoming one and they are trying to keep any countries like Hungary from escaping. By the looks of your picture, I think that if you will take good care of yourself, and with a bit of luck, health and otherwise, you may actually get to see it become one. And the reason why it will become one is because a very deeply entrenched elite will refuse to accept change, even though it is becoming increasingly clear that change is needed. They were threatened by the police with arrest and then left the building. Joe try and keep up. However, good to see you agree that MTV is a state propaganda machine. Well, if AfD members would have done the same in Germany at a public broadcast site, they would have been arrested most likely, not just threatened. Oh scheisse! Did I commit the mortal sin of engaging in whataboutism? Whataboutism! The mortal enemy of the hypocrite! Joe I think your glass ball has a crack or you have sucked from your fingers. Joe would kill if he could. Shades of 1956, I was there. I hope they will have better luck. I can see you as one of the first turncoats should the enraged students and workers chase your corrupt and deceptive messiah out of office and shut down that troll farm that employs you. The paper you cite as evidence of press freedom reaches less than 1% of Hungarians. The Orbán autocracy manages to leave a few cracks open, to create the impression of press competition. The government fully controls public media, the monopolistic national wire service, and Orbán’s cronies own 90% of the private media. These crooks manipulate the media coverage like a gang of thugs. The public at large has access only to snippets of information. Welcome to thought control. Yes, the same freedomhouse which ranks Germany near the top. Same Germany where for five days the national media shunned the story of the 1,200 raped or molested women. The same Germany which introduced the social media censorship law. The same Germany, whose own national state media in fact treats the opposition AfD worse than Hungary’s national media does with the Hungarian opposition, and so on. So yes, very credible organization, which we should blindly believe in. As for the popularity of Nepszava, correct me if I am wrong here but most Hungarians know of it. Most of them can access it on line. If it only reaches as few as it does, it may have to do with the lack of popularity of its angle perhaps? It made the news even in the USA. On yahoo there is lots of comments on it. 100% wish they had such a law in the US to limit overtime to only 400 hours per year. Most americans work 60-70 even 80 hours a week, salaried workers always have to work unlimited hours. I think most of the american commenters are correct, as 3/4 thinks Hungarians are just too lazy !